You modify a SQL Server 2008 Integration Services (SSIS) package. The package extracts data from a text file and loads this data to a SQL Server 2008 table as shown in the following two exhibits. You need to update the package to extract data from multiple text files of the same directory. A. Add a variable to the package. B. 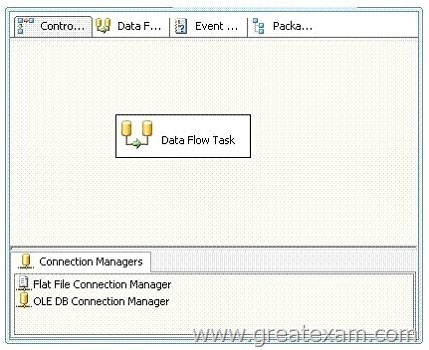 Add a variable to the data flow task. C. Add a Foreach Loop container to the package. D. Add a For Loop container to the package. E. Add an expression to the Flat File Source component. F. Add an expression to the Flat File connection manager. You are developing a SQL Server 2008 Integration Services (SSIS) data flow that extracts data from two sources. Each source database is located on a different server. Each source is based on a SELECT statement that uses an ORDER BY clause. The data flow is as shown in the following diagram. You need to ensure that data from each query is included in each row in the data flow. You want to achieve this goal by using minimum amount of execution time. A. Add a Sort transformation for each data flow. B. Add an OLE DB Command transformation for each data flow. C. Update the sorting properties in each source component. D. Replace the Merge Join transformation with a Union All transformation. You are developing a SQL Server 2008 Integration Services (SSIS) package. The package uses an OLE DB connection manager to connect to a third-party database server. The database does not support Integrated Windows authentication. You create an XML configuration file that provides configuration for the connection manager. You add the configuration file to the package. When the package executes, you receive an error message which indicates that login failure occurred. You need to execute the package successfully. A. Edit the XML configuration file. B. Use an indirect XML configuration. C. Run the package on the same server as the third-party database server. D. Use a Microsoft ADO.NET connection manager instead of an OLE DB connection manager. You plan to create a list of customers by using a List control. he customer data is stored in the Customers table in the data source, and the order data is stored in the Orders table. You need to define the required dataset or datasets for this report. A. Create a query that joins the two tables in the data source by using the JOIN clause. Add the query as a single data set to the report. B. Create a query that combines the two tables in the data source by using the UNION operator. C. Create a query for each table. Group both tables on the column that is used to join the tables. Add both queries as separate data sets to the report. D. Create a query for each table. Sort both tables on the column that is used to join the tables. You need to ensure that alternate rows in the table have a pale green background. Which code segment should you use for each text box? A Multidimensional Expressions (MDX) query used in the report contains a parameter to display sales data for various product categories. You write the following query. You discover that the query generates an error when executed. A. Remove the NON EMPTY clauses. B. Replace the CHAPTERS axis with the ROWS axis. C. Replace the CHAPTERS axis with the SECTIONS axis. D. Rewrite the query to display the Order Quantity on the COLUMNS axis, the Calendar Year on the ROWS axis, and the Category data on the PAGES axis. You design a report by using SQL Server 2008 Reporting Services (SSRS). The report uses a Table data region and contains a dataset. The dataset has a column named LastName. You need to ensure that the report items are grouped by the first character in the LastName column. Which expression in the Group properties dialog box should you use? You create a report in SQL Server 2008 Reporting Services (SSRS) solution. You write the following code segment in the report. The code segment generates errors when compiled. A. Remove the Private keyword from the function definition. B. Remove the Shared keyword from the function definition. C. Declare the function as Public Shared instead of Private Shared. D. Create a custom assembly by using Microsoft Visual Basic .NET. Declare the function as Public Shared. You develop a SQL Server 2008 Reporting Services (SSRS) solution. You add a report that contains a single dataset and a query parameter. You need to ensure that the report executes without user interaction from the Report Manager. A. Configure the report to use snapshot execution. B. Configure available values for the parameter from the dataset. C. Configure the default value for the parameter based on an expression. D. Configure the parameter data to refresh whenever the parameter is refreshed. The report will be included in a Windows Forms application that is distributed to remote users. These users have no access to the report server. You need to ensure that the application renders the report correctly. A. Use the ReportViewer control along with the LocalReport property. B. Use the ReportViewer control along with the RemoteReport property. C. Use the Render method of the Reporting Services Simple Object Access Protocol (SOAP) API. D. Use the RenderStream method of the Reporting Services Simple Object Access Protocol (SOAP) API. Detail information is displayed each time the users render the report. – Summary information is displayed when the report is initially rendered. – Detail information is displayed only when the users click a column header. A. On the column that contains detail information, set the hidden property to True. Set the Visibility can be toggled by another report item property to True. B. On the column that contains detail information, set the hidden property to False. Set the Visibility can be toggled by another report item property to False. C. On the column that contains detail information, set the hidden property to True. D. On the column that contains detail information, set the hidden property to False. The report contains a parameter named Category that is used to filter a list of products. You modify the report parameter to allow multiple values. You need to modify the report to help search for multiple Category values by using minimum amount of development effort. A. Implement the query in a view. B. Implement the query in a table-valued user-defined function. C. Modify the query to use the IN operator instead of the = operator. D. Implement the query in a stored procedure that uses dynamic SQL to execute the query. You are developing a SQL Server 2008 Integration Services (SSIS) project in Business Intelligence Development Studio. You configure the project properties as shown in the following image. You need to create a deployment manifest for all packages in the project. A. Build the Integration Services project. B. Modify the AllowConfigurationChanges property of the project. C. Copy each package. Rename each copy with a .SSISDeploymentManifest file extension. D. View the code of each Data Transformation Services (DTS) package. Copy the first <DTS:Property> xml node to a file with a .SSISDeploymentManifest file extension. You create a SQL Server 2008 Integration Services (SSIS) package by using SQL Server 2008. You use a development server named SQL_DEV1. There is no network connectivity between the development server and the production server. You deploy the package to the SQL_PROD1 server. The package fails to execute. The error message states that the package cannot connect to the SQL_DEV1 server. You need to modify the package to refer to the SQL_PROD1 server when being executed. A. Modify the properties of the package to use the DontSaveSensitive package protection level. B. Modify the deployment manifest file in Microsoft Notepad, and then modify the connection string manually. C. On the Connection Managers tab of the Execute Package utility, select the Connection Manager check box, and then modify the connection string. D. Modify the properties of the package to use the ServerStorage package protection level. – Processes multiple files by using a ForEach Loopcontainer. – Imports the contents of the files to a table by using a Data Flowtask. – Logs the results of the status into a table by using an Execute SQL task. You need to ensure that all the tasks of the package except the Execute SQL task execute within a single transaction. F. In the Execute SQL task, configure the TransactionOption property to Supported. You need to apply the configuration to the deployed package. A. 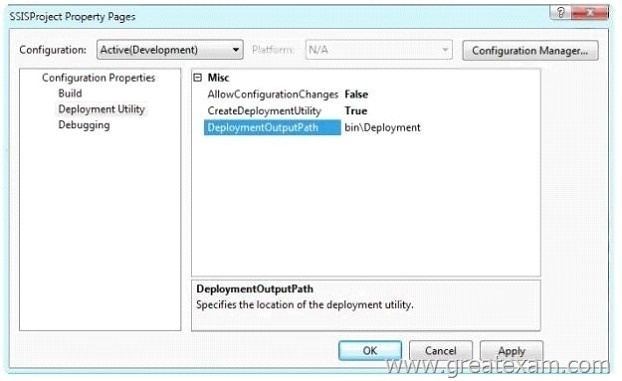 Use the Deployment utility. B. Use the SETX command line utility. C. Use the DTUTIL command line utility. D. Use the DTEXEC command line utility. You need to identify query sessions that execute a query for more than 30,000 ms.
You update a role named Managers for the Human Resources cube in your SQL Server 2008 Analysis Services (SSAS) database. The database contains a dimension named Employee. You plan to configure the security for the Managers role. You need to allow the Managers role to access aggregate data based on only three or less employees. A. Add members of the [Employee]. [Employees] hierarchy that contain three or less children to the denied set for the Managers role. B. Add members of the [Employee]. [Employees] hierarchy that contain more than three children to the allowed set for the Managers role. C. Add the following expression to the Allow Reading property in Cell Data in the Managers role. 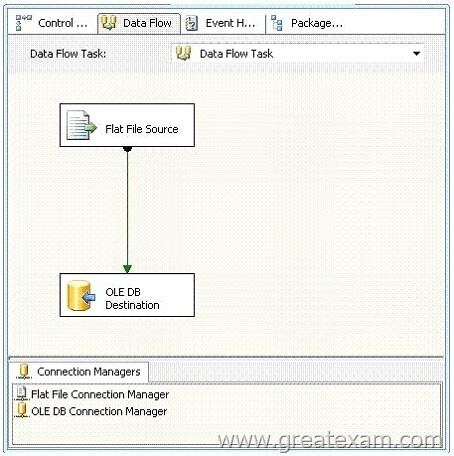 D. Add the following expression to the Allow Reading property in Cell Data in the Managers role. You plan to refresh data in a partition every two hours. You need to implement the incremental processing strategy. Which XML for Analysis (XMLA) command should you use? If you want to get more 70-448 exam preparation material, you can download the free 70-448 braindumps in PDF files on GreatExam. It would be great helpful for your exam. All the 70-448 dumps are updated and cover every aspect of the examination. Welcome to choose.